A very public apology to the Edinburgh SNP Group. New relationships are always difficult. Expectations must be managed and boundaries must be respected. People get stressed, make mistakes and learn lessons. This week the SNP Group in the City of Edinburgh Council have made three complaints about two of my recent blogs. These complaints are not without merit (more on that later), but I do wonder if the issue here is also a clash of cultures. In 2015 it was widely reported that SNP candidates had to sign an agreement saying they would not “publicly criticise a group decision, policy or another member of the group”. At the time this was described by other parties as a “snub to civil liberties” and “Stalinist”. I’ve no problem with the SNP having its own internal rules, but the Labour Party has its own rules – these are the only ones I’m obliged to respect. My blog was not about me opposing the motion to refer the weeds problem to TEC (I support it). It was not because I feel chemicals are the only way to deal with weeds (I have concerns about their use). It was not because I hate biodiversity (I don’t). The blog was about me representing my constituents and suggesting the City of Edinburgh Council should be seen to be tackling the problem right now (that is now happening) as well as planning for 2018. I am willing to accept that those points may not have been clear in my blog (all my blogs are within the 200-300 word limit set by newspapers for letters) and I apologise for that unreservedly. The third complaint relates to housing – a much more important issue. On the 29th of June Cllr Steve Burgess and principally Cllr Susan Rae (both Scottish Greens) had a motion passed by Full Council (debate video here) which was a “call for a report on the steps that need to be taken to implement a city-wide Rent Pressure Zone to limit increases in high rents in the private rented sector” – A move which I wholeheartedly support. On the 10th of July Cllr Kate Campbell posted a blog on the SNP website which made some good points but also said she was “delighted” that a “motion on creating a rent pressure zone in Edinburgh was passed at council”. Not only was she wrong about what the motion entailed (the difference is more than semantics), she also failed to mention the fact that it was proposed by the Scottish Greens. The blog contained other errors and omissions relating to Scottish Government policy. Given that those policies are not endorsed by the City of Edinburgh Council, I felt completely free to offer an alternative view on SNP housing policy via my blog. In her “formal” complaint about my blog to the Labour Group Whip, Cllr Kate Campbell described my blog as “a pretty silly piece” and “unhelpful”. I’ve no problem with the first point, but I do wonder who my blog was unhelpful to given that it focused on SNP policy? The SNP? Private landlords? I don’t really see it as being my job to be helpful to other political parties. If politicians put forward their opinions, they should be willing to have those views challenged. That’s exactly what Cllr Lesley Macinnes did when she publicly attacked me in the Evening News on Friday! Cllr Kate Campbell did raise one further point in her complaint which relatied to a misjudgement I did arguably make. Duncan Hothersall made the point on twitter that Cllr Kate Campbell was “bemoaning ‘brutal austerity’ in Edinburgh. Tories cut grant by 1.5%. SNP cut council funding by 4.6%.”. I replied with a link to my blog and copied in Cllr Kate Campbell saying “I wrote a brief response to @KateC_SNP earlier”. Cllr Kate Campbell has said that I did not need to copy her in – she is absolutely right, and I apologise unreservedly for that. In conclusion, new relationships are always difficult. Expectations must be managed and boundaries must be respected. People get stressed, make mistakes and hopefully learn lessons. However, nobody benefits from having a controlling partner. Will I continue to stand up for my constituents? Yes! 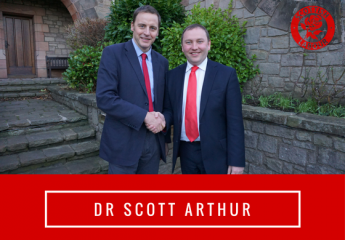 Will I continue to defend Edinburgh against Scottish Government cuts? Yes! Will I continue to stand up for my party’s values? Yes! Will I challenge views from other parties that I don’t agree with? Yes! Will I be more careful about how I do that? Yes! Important: these are my views alone and not endorsed by anyone else!